Our newest of slides to our arsenal is our 20' Dual Lane slide. 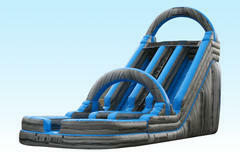 With its sleak blue and grey marble material, not only does this slide look amazing it is amazing!! Stairs go up the middle and on either side is the slides. This will be an adrenaline rush!